Jay and Laura Stoms in Southern Africa. : 'Gathering of Internationals' @ Univeristy of Stellenboch (SA). 'Gathering of Internationals' @ Univeristy of Stellenboch (SA). Please pray for us! 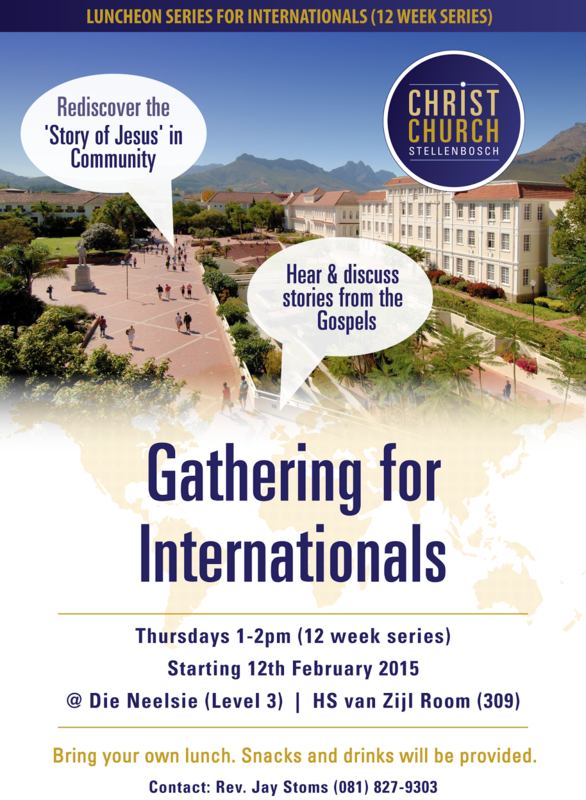 This Thursday, the 12th of February, we plan to launch the first in a series of lunchtime gatherings for 'International Students' at the University of Stellenbosch (South Africa). We are seeking to create an environment where 'Internationals Students' can rediscover the 'Story of Jesus' by hearing and discussing stories from the gospels. Rev. Jay, Laura, Clara, Lauren and Katherine Stoms.